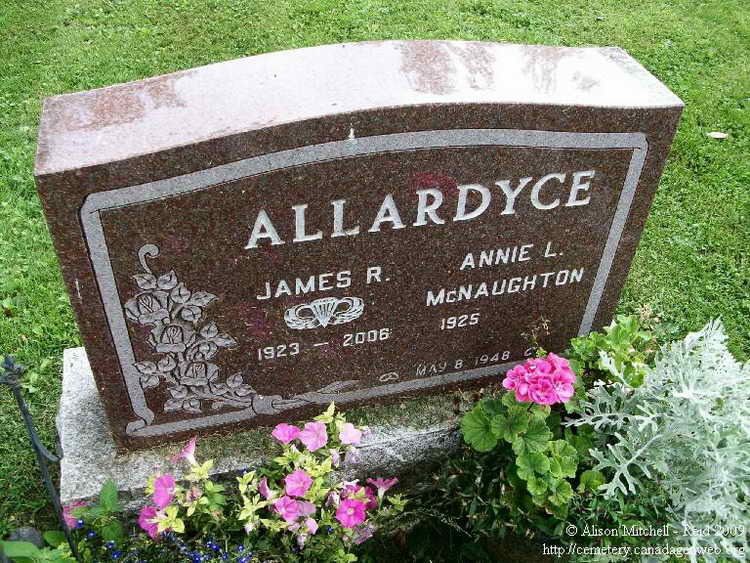 Grave marker for James R. Allardyce in the Medway/Decker Cemetery, London (Middlesex county), Ontario, Canada. James enlisted in the Army on 24 July 1943. Pfc Allardyce was transferred from the 11th Replacement Depot in England, to Company B, 508th PIR on 10 August 1944. Pfc Allardyce was listed as wounded in action on 19 September 1944 and again on 27 September 1944. His military awards include the Purple Heart with Oak Leaf Cluster and the Bronze Service Arrowhead device for the Holland campaign and Airborne operations. NOTE: Although the inscription shown is not up to date his wife Annie died on 7 March 2013. Funeral service will take place Wednesday, November 15, 2006, at noon at Frankenmuth United Methodist Church. The Rev. David Eardley will officiate. Burial will take place at 11 a.m. Thursday, November 16, in Medway Cemetery, Ilderton, Ontario. Jim's family will receive visitors Tuesday from 2-8 PM at the Cederberg Funeral Home of Frankenmuth, 590 N. Franklin St., and at church Wednesday from 11 AM until the time of service. Those planning an expression of sympathy may wish to consider memorials to Frankenmuth United Methodist Church, Bethel Presbyterian Church in London Township, Ontario, or Michigan's Own Military and Space Museum in Frankenmuth.